Strange that the wii has the highest attach rate. I figured it would be the DS because of the massive number of systems. But I know a good part of wii sales were just for wii Sports. yeah the tie-in ratio has always made it clear that the number of people who bought wii sports and nothing else was grossly overstated. either there were way more people hoarding 20+ more tradtional games than generally believed or the average casual wii owner gradually built up to a really big collection. Mario kart, NSMB, wii sports, wii sports resort, wii fit. throw in a couple just dance iterations, a couple more things with mario in the title, a couple random party games. people could easily reach 8 or 10 games buying only the most stereotypical casual games. Handheld console have traditionally lower tie ratio than stationary consoles. My guess is there are two factors that influence this trend. 1) handheld consoles being typically one per user in a household whereas games are typically shared. 2) handheld console catered more toward younger audience/casual audience which spend less on games compared to the core audience who buy stationary console (I'm generalizing here). A revision in itself doesn't automatically hurt tie ratio especially because there is a common practice to trade in the previous model which become available on the used market. The Switch tie-ratio seems very low. Tie ratio is destined to increase with time. However it's a bit a mystery what Switch tie ratio could end up being simply because there is no precedent for a hybrid console. 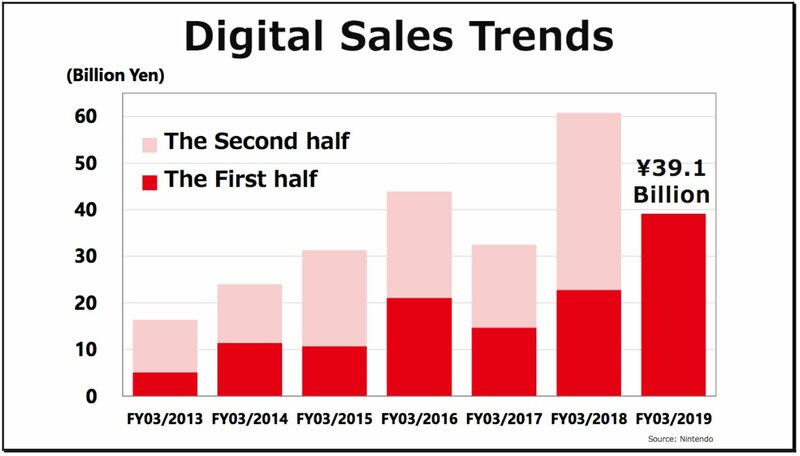 Another important point is that NSW is the first Nintendo console with a notable presence of digital only games sales which won't be included in the total sales. 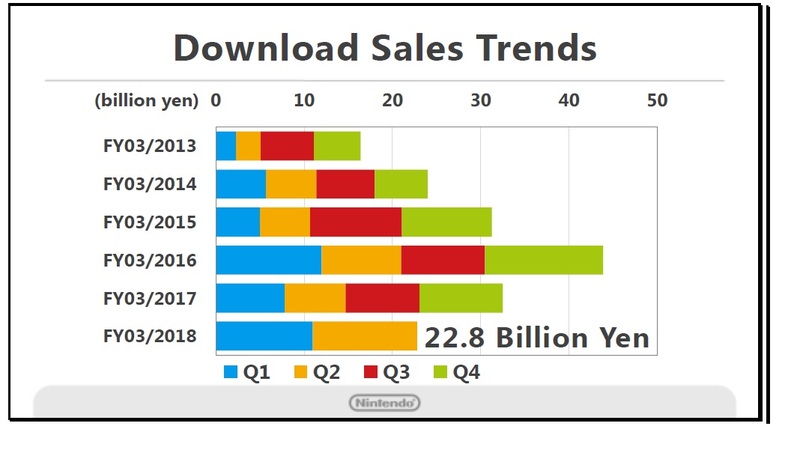 Expect a very high percentage of the total software sales to be composed by Nintendo games (my guess > 40%). there's a big drop in hardware sales (if you compare previous generations with both console+handheld) now that they're only going to focus on one hybrid system. There will be a jump in profitability. Well the jump already began in the previous fiscal year. This is something people tend to dismiss with "it's not meant to sell as much as a console plus one handheld!" and it always amazes me, as if such a sentence should somehow fill a void of several hundred million dollars in revenue. Also because the theory seemed to be that focusing on one hybrid system would compress development budgets and increase software sales while reducing software droughts. Two of these 3 things are not happening. - or the Switch has to sell 20 million a year for 5 years in a row while selling unrealistical amounts of software to strike even with the 3DS+WiiU combo, assuming they have twice the profitability on it. I guarantee you it dwarfs any other Nintendo system at a comparable timeframe when taking into account all factors. Yeah, this happened. Reminder that 3DS got a 80$ cut in its first year. It may not be happening now but it should at some point in the future. The WiiU was sold at a loss and the 3DS price drop shortly after it's release surely impacted its profitability. 1- Their Mobile and IP-related Licensing is slowly growing and while it might be currently less than 4% of their Total Revenue, this percentage is prone to increase as they have more games in the market. 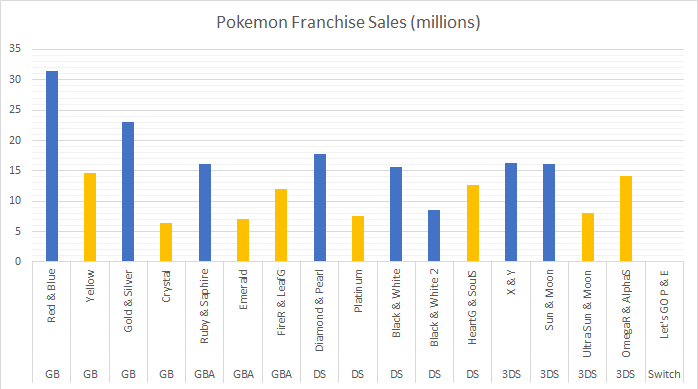 2- The 3DS represents currently 17% of their Total Revenue in 2018. 3- The Online Subscription might at some point bring significant Revenue to Nintendo, obviously in a smaller proportion compared to Sony and Microsoft. The next one (after Nintendo releases the first half results) will be fairly big. When are they releasing them? 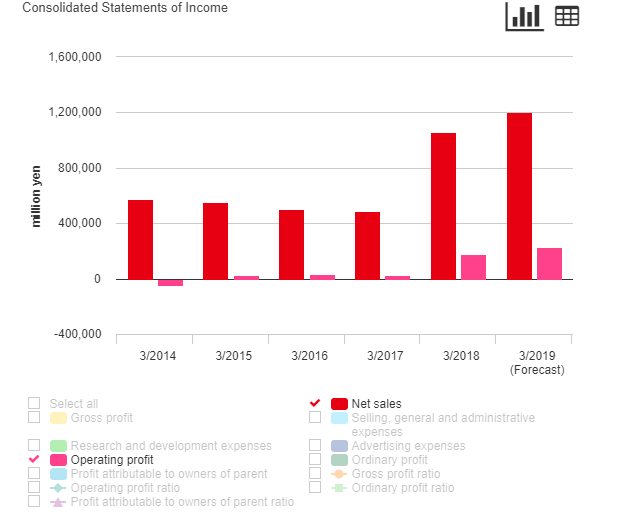 See the Revenue, Operating income, Net income chart in the OP. Switch era will be far more profitable than 3DS+WiiU era. I always forget that Goldeneye 007 sold more copies worldwide than Ocarina of Time did. That’s crazy. Why did Nintendo sold Rare, again? Also I hope the Switch can be the first non portable only Nintendo hardware than can finally sell more units than the NES! Rare was sold in 2002 (already 16 years have past!). Only real consoles count! You know, for gamers! 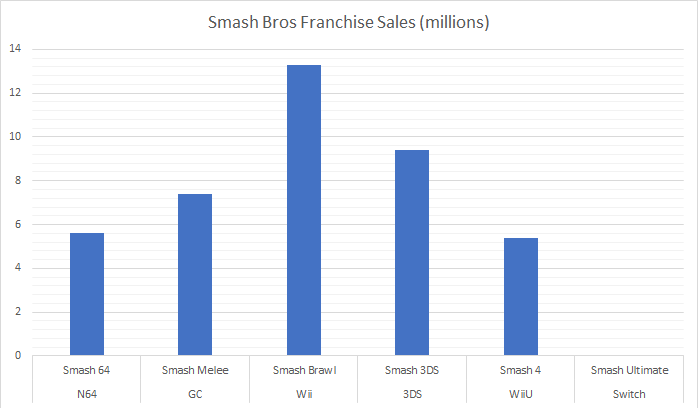 Take a look at the graphs below showcasing Nintendos Revenue since 2014 to see how they the strategy so far has improved since the WiiU years:. Well, that doesn't say much really. The WiiU was Nintendo's biggest failure. By next year, they're pretty much guaranteed 8 right? Animal crossing guaranteed to sell 10 millions in a few months? In what universe? Yeah sorry, what I meant was that there will be 8 games at least by next year that are going to sell 10+ million in their lifetime. Damm, another week? C'mom, nintendo, a month has passed alreadly, why the hold up? BTW, They dont do presentations/qa session on those, do they? It was mainly referring to the claim Switch needs to sell WiiU + 3DS to validate their strategy. Still, if you take a look at Celine's graph on the first topic you will realise the same thing applies when compared to any other year in Nintendo's history except for the Wii-Era. Both Wild World and New Leaf surpassed the 10million mark. Considering the fact all of Nintendo major franchises have broken record sales, Switch's insane SW/HW ratios and Animal Crossing not receiving a mainline game in more than 5 years, it's not an outlandish claim. I for one believe Animal Crossing Switch might end up being close to 20 million in the right circumstances. This one is a fairly big update because I’ve updated all the WiiU and 3DS games that previously had sales data until December 2014 to December 2017. Captain Toad (WiiU), Pikmin 3, The Legend of Zelda: Twilight Princess HD, Lego City Undercover (WiiU), Miitopia (3DS) and Mario & Luigi Paper Jam. Note that I decided to remove Pokken from the WiiU chart because while the game surely shipped 1 million units it seems in the markets where Nintendo publish it (outside Japan) it didn’t. Same reason why Hyrule Warriors isn’t present. - 3DS first-party software sales* surpassed NES. For this parameter 3DS is the fourth best console behind Wii, DS and GB/C. - In the end WiiU first-party software sales* did not surpassed GC first-party software sales* but was very close, 58.65M vs 61.83M. It should be noted that WiiU games like Pokken Tournament and Hyrule Warriors did cross 1M worldwide but Nintendo didn't publish the game in the japanese market which I suppose is the reason why they aren't on the list. - As March 2018 the ratio between first-party software sales* and total software sales on 3DS is 51.35%. This denote 3DS difficulties in securing strong selling third-party support for its handheld (indie is the future baby). 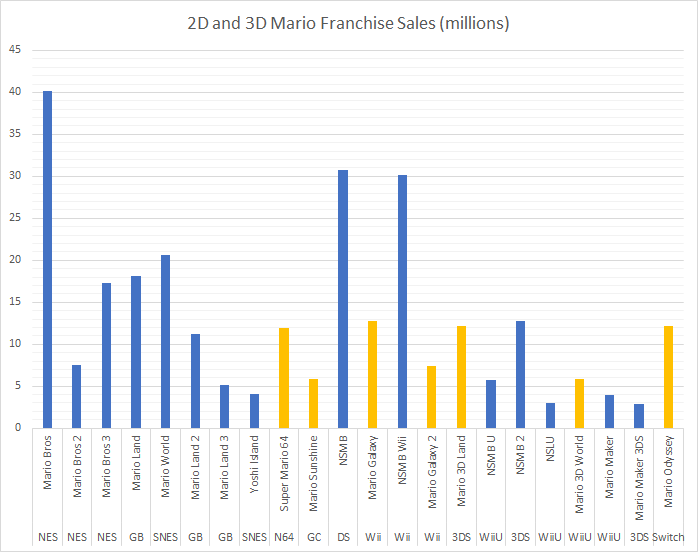 - Speaking of the ratio between first-party software sales* and total software sales, WiiU ratio is 57.49% as March 2018 which is a record even for a first-party driven console manufacturer like Nintendo. Finally a Nintendo console beat the N64 which had the highest ratio for a long time (I'm not sure if it should be considered a good thing though). - Big jump for DKC TF and Mario Party Island Tour (~1M). - Kirby Triple Deluxe is now the third best selling Kirby game but it's going to be blown away by Kirby Star Allies. - Despite the complains from Mario Party fans, Mario Party 10 and Mario Party Island Tour performed in line with the series average. - NES Classic and SNES Classic combined sales are around 11-12 million units as September 2018. * approximation summing million sellers. DS software seems to be dead (only shipped 10K in total). Thanks for the update Celine. Great job as usual. Nice update. Thanks, this thread is super useful. Fantastic job, Celine. Thank you for doing this. It appears that Iwata will make good on his promise to return Nintendo to Wii like profitability. I imagine 19/3 will look like 8/3, especially with Animal Crossing, new mainline Pokemon, and a Switch revision next year. Thank you so much for updating this Celine! Wow, was very happy to see Captain Toad and Pikmin 3 both crossed the million mark on Wii U. Tropical Freeze also nearly made it to 2 million! Iwata and following management commitment was to return Nintendo to its historical profitability (let's say an operating income of 100 billion yen per year). Wii/DS era profits should be considered exceptions just like WiiU/3DS era losses were a negative exception (considering the long history of Nintendo in the videogame business). Ah, was it historic? I thought I remembered them saying Wii/DS, but it could've been misquoted or whatever. Revelation sales are included in Fates number, maybe you must add the SKU in game's title. Is this including digital sales as well? Does this include Virtual Console sales, e.g., Galaxy? The games sales in OP include digital sales if the original release had a digital version. Digital re-releases sales aren't counted. Do you know how its calculated? Is each game counted separatedly or not? Each version is counted as one like Pokémon. I was wondering how Fates sales would be calculated. I bought the special edition for instance, which included all 3 versions of it on 1 cart. I assume that would be 3 copies sold then? Damn, thanks Celine! So happy to see Pikmin officially moved over a million units! 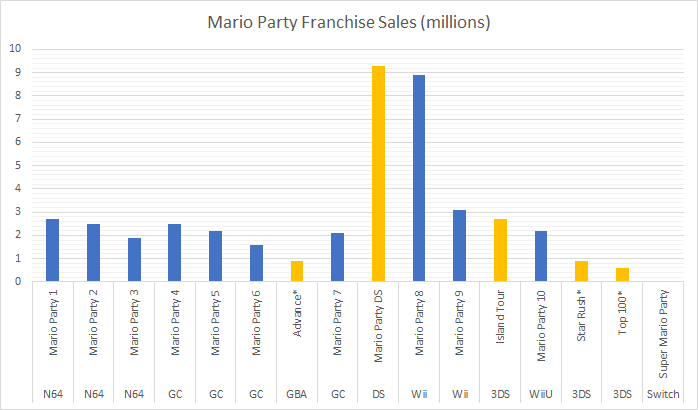 It's always been the specific phrase of "Nintendo-like profits"
Peleo 4m for Mario Party is too low imo. The game will basically have a second launch with the attractive Joy-Con bundle and will shine in December. Super Mario Party is already at 1.5mil sold according to the results briefing. Just saw the tweet, guess I will need to update my predictions to 6m. Eh, find this pretty misleading with Fates. For Pokemon games, they can be purchased independently. However, Revelation, the third version of Fates, cannot. If you do not count downloaded paths, then it isn't misleading. Maybe I need to concede that I'll never know what Color Splash sold other than < 1 mil. Thanks for doing this Celine, really great resource to have. I'm happy to officially see Dream Team surpass Sticker Star, I always wondered if it did given how close their numbers were beforehand. Happy to see Paper Jam pass a million too, I wonder if that's good given the low cost its development must have been, or if expectations were higher. Great job and thank you Celine.